A child using a cordless handheld drill to assemble a bookcase. A drill (from the Dutch term Drillen) is a tool with a rotating probe called a drill bit, used for drilling holes in various materials. A "chuck" (specialized clamp) at one end of the drill grips the drill bit, which is pressed against the target material. The tip of the drill bit cuts into the target material, either slicing off thin shavings (in the case of twist drills or auger bits), grinding off small particles (in oil drilling), or crushing and removing pieces of the workpiece (in SDS masonry drills). Drills are commonly used in woodworking, metalworking, construction, and do-it-yourself (DIY) projects. The earliest drills were bow drills, dating back to the ancient Harappans and Egyptians. The drill press as a machine tool was developed from the bow drill and is many centuries old. It was powered by various power sources over the centuries, including human effort, water wheels, and windmills, often with the use of belts. With the coming of the electric motor in the late nineteenth century, there was a great rush to power machine tools with such motors, and drills were among them. Invention of the first electric drill is credited to William Blanch Brain and Arthur James Arnot in 1889, at Melbourne, Australia. Wilhelm Fein invented the portable electric drill in 1895, at Stuttgart, Germany. In 1917, Black & Decker patented a trigger-like switch mounted on a pistol-grip handle. The inside of an electric drill. There are many types of drills: some powered manually, others using electricity or compressed air as the motive power, and a minority driven by an internal combustion engine (for example, earth-drilling augers). Drills with a percussive action (such as hammer drills, jackhammers, or pneumatic drills) are usually used in hard materials such as masonry (brick, concrete and stone) or rock. Drilling rigs are used to bore holes in the earth to obtain water or oil. An oil well, water well, or holes for geothermal heating are created with large drill rigs up to a hundred feet high. Some types of hand-held drills are also used to drive screws. Some small appliances may be drill-powered, such as small pumps, grinders, and so on. 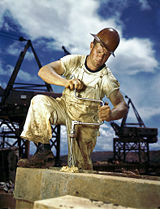 Carpenter using a crank-powered brace to drill a hole. An old hand drill or "eggbeater" drill. A large drill used in construction for drilling out holes needed for the electrical wiring. A drill in the shape of a pistol is today a useful and ubiquitous type of power tool. There is an endless variety of subtypes of this basic form factor, with the notable exception being the Right Angle Drill, a specialty tool used by trade specialists such as plumbers and electricians. For much of the twentieth century, many attachments could commonly be purchased to convert corded electric hand drills into a range of other power tools, such as orbital sanders and power saws, more cheaply than purchasing conventional, self-contained versions of those tools. The greatest savings resulted from the lack of an additional electric motor for each device. As the prices of power tools and suitable electric motors have fallen, however, such attachments have become much less common. A similar practice is currently employed for cordless tools where the battery, the most expensive component, is shared between various motorized devices, as opposed to a single electric motor being shared between mechanical attachments. The hammer drill is similar to a standard electric drill, except that it is provided with a hammer action for drilling masonry. The hammer action may be engaged or disengaged as required. The hammer action is provided by two cam plates that make the chuck pulse rapidly forward and backward as the drill spins on its axis. This pulsing (hammering) action is measured in Blows Per Minute (BPM) with 10,000 or more BPM being common. Because of the relative masses of the chuck+bit and the remainder of the drill the energy transfer is relatively inefficient and can sometimes make it difficult for larger bits to penetrate harder materials such as poured concrete. Vibration is quite noticeable by the operator, and the cams are generally made from hardened steel to avoid them wearing out quickly. Most electric hammer drills are rated at between 6.3 and 9 amps, and are restricted to standard masonry bits 1/2 inch in size maximum. A typical application for a hammer drill would be to install electrical boxes, conduit straps or shelves in concrete. Compare this to a rotary/pneumatic hammer drill where just the bit is accelerated to the work. This is accomplished through a piston design, rather than a spinning cam. Rotary hammers have relatively little vibration and penetrate most building materials. They can also be used as "drill only" or "hammer only," which extends their usefulness for tasks such as chipping brick or concrete. Hole drilling progress is greatly superior to cam-type hammer drills, and these drills are generally used for holes of 3/4 inch or greater in size. A typical application for a rotary hammer drill would be to bore large holes for lag bolts in foundations, or to install large lead anchors in concrete for handrails or benches. A standard hammer drill accepts 1/4 inch and 1/2 inch drill bits, while a rotary hammer uses SDS or Spline Shank bits. These heavy bits are adept at pulverizing the masonry and drill into this hard material with relative ease. However there is a big difference in cost. In the UK typically £12 upward for a cam hammer and £35 up for a rotary/pneumatic. In the U.S., a typical hammer drill will cost between $70 and $120, and a rotary hammer between $150 and $500 (depending on bit size). For DIY use or to drill holes less than 1/2 inch in size, the hammer drill is most commonly used. The rotary hammer drill (also known as roto hammer drill or masonry drill) is an electric drill type dedicated to drilling holes in masonry. The rotary hammer drill is a percussion drill that uses a weight to create the impact force on the masonry bit. Generally, the drill chuck of the rotary hammer drill is designed to hold SDS drill bits. Some styles of this drill are intended for masonry drilling only and the hammer action cannot be disengaged. Other styles allow the drill to be used without the hammer action for normal drilling, or hammering to be used without rotation for chiseling. A cordless drill with clutch. 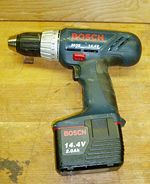 A cordless drill is a type of electric drill which uses rechargeable batteries. These drills are available with similar features to an AC mains-powered drill. They are available in the hammer drill configuration and most also have a clutch setting which allows them to be used for driving screws. Also available now are Right Angle Drills, which allow a worker to drive screws in a tight space. These are currently less useful than the corded version however, as one of the main functions is drilling holes through joist and studs to run electrical and plumbing. While recent battery innovation allows significantly more drilling, the large diameter holes required (typically 1/2"-1" or larger) drain current cordless drills quickly. For continuous use, a worker will have one or more spare battery packs charging while drilling, so that he or she can quickly swap them, instead of having to wait an hour or more for recharging. Although there are now Rapid Charge Batteries that can charge in 10-15 minutes. Early cordless drills started with interchangeable 7.2 V battery packs, and over the years available battery voltages have increased, with 18 V drills being most common, and 24V drills are available. This allows these tools to produce as much torque as some mains-powered drills. The drawback of most current models is the use of nickel-cadmium (NiCd) batteries, which have limited life, self-discharging and eventually internally short circuiting due to dendrite growth. This severely limits battery life, and poses a hazardous materials disposal problem. A lot of drill manufacturers, including DeWalt, Ryobi, and RIDGID, are now using lithium ion batteries. The main advantages are very short charging time, longer life, and lighter battery weights. Instead of charging a tool for an hour to get 20 minutes of use, 20 minutes of charge can run the tool for an hour. Lithium-ion batteries also have a constant discharge rate. The power output remains constant until the battery is depleted, something that nickel-cadmium batteries also lack, and which makes the tool much more versatile. Lithium-ion batteries also hold a charge for a significantly longer time than nickel-cadmium batteries, about two years if not used, vs. 1 to 4 months for a nickel-cadmium battery. The handles of cordless drills are usually made from polymorph which is easy and quick to mold to a comfortable shape for holding. The main body of the drill is usually made from polythene as it is able to withstand the high temperatures which the drill reaches. A drill press (also known as pedestal drill, pillar drill, or bench drill) is a fixed style of drill that may be mounted on a stand or bolted to the floor or workbench. A drill press consists of a base, column (or pillar), table,spindle (or quill), and drill head, usually driven by an induction motor. The head has a set of handles (usually 3) radiating from a central hub that, when turned, move the spindle and chuck vertically, parallel to the axis of the column. The table can be adjusted vertically and is generally moved by a rack and pinion; however, some older models rely on the operator to lift and reclamp the table in position. The table may also be offset from the spindle's axis and in some cases rotated to a position perpendicular to the column. The size of a drill press is typically measured in terms of swing. Swing is defined as twice the throat distance, which is the distance from the center of the spindle to the closest edge of the pillar. For example, a 16-inch (410 mm) drill press will have an 8-inch (200 mm) throat distance. Less effort is required to apply the drill to the workpiece. The movement of the chuck and spindle is by a lever working on a rack and pinion, which gives the operator considerable mechanical advantage. The table allows a vise or clamp to position and lock the work in place making the operation much more secure. The angle of the spindle is fixed in relation to the table, allowing holes to be drilled accurately and repetitively. Speed change is achieved by manually moving a belt across a stepped pulley arrangement. Some drill presses add a third stepped pulley to increase the speed range. Modern drill presses can, however, use a variable-speed motor in conjunction with the stepped-pulley system; a few older drill presses, on the other hand, have a sort of traction-based continuously variable transmission for wide ranges of chuck speeds instead, which can be changed while the machine is running. Drill presses are often used for miscellaneous workshop tasks, such as sanding, honing or polishing, by mounting sanding drums, honing wheels and various other rotating accessories in the chuck. This can be dangerous on many presses, where the chuck arbor is held in the spindle purely by the friction of a Morse taper instead of being held securely by a drawbar. Radial loads in such a system often cause the arbor to work loose, causing the chuck (and whatever is held in it) to fall off the machine. The geared head drill is identical to the drill press in most respects, however they are generally of sturdier construction and often have power feed installed on the quill mechanism, and safety interlocks to disengage the feed on over-travel. The most important difference is the drive mechanism between motor and quill is through a gear train (there are no vee belts to tension). This makes these drills suitable for use with larger drill bits. A radial arm drill is a geared head drill that can be moved away from its column along an arm that is radiates from the column. 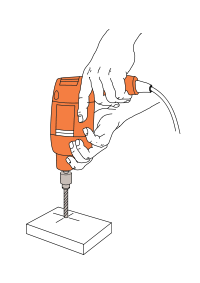 These drills are used for larger work where a geared head drill would be limited by its reach, the arm can swivel around the column so that any point on the surface of the table can be reached without moving the work piece. The size of work that these drills can handle is considerable as the arm can swivel out of the tables area allowing an overhead crane to place the workpiece on the fixed table. Vises may be used with these machines but the work is generally bolted to the table or a fixture. Milling machines, metal lathes and routers are also often used for drilling. ↑ National Archives of Australia, Specifications for registration of patent by William Blanch Brain and Arthur James Arnot titled - Improvements in electrical rock drills coal diggers and earth cutters. Retrieved September 20, 2008. ↑ US1,245,860 (PDF version) (1917-11-06) S. D. Black & A. G. Decker Electrically driven tool Retrieved September 20, 2008. Briney, Doug. 1983. The Home Machinist's Handbook. Blue Ridge Summit, PA: Tab Books. ISBN 0830615733. Dodds, Steve. 2005. Tools: A Tool-by-Tool Guide to Choosing and Using 150 Home Essentials. Richmond Hill, Ontario: Firefly. ISBN 1554070600. Ettlinger, Steve. 2003. The Hardware Cyclopedia: The Complete Illustrated Guide to Everything Sold in Hardware Stores. Philadelphia: Running Press. ISBN 0762414383. Kelsey, John. 2004. Field Guide to Tools: How to Identify and Use Virtually Every Tool at the Hardware Store. Philadelphia: Quirk Books. ISBN 1931686793. How To Use a Power Drill. The Spruce. This page was last modified on 9 October 2017, at 21:25.